Jan. 26 /CSRwire/ - ATHENS, GREECE. 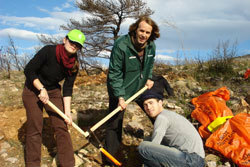 - January 26, 2009 - ARTMARATHON, an international non-profit Swiss foundation, and Athens-based EuroCharity jointly planted 42 trees on Mt. Pentelikon on Sunday morning, as part of a global, 42-year "ARTMARATHON" that commenced in Marathon, Greece on December 10, 2008. EuroCharity and the ARTMARATHON Foundation would like to thank Mr. Dimitris Stergiou-Kapsalis, Mayor of Penteli and President, Association for the Protection and Development of the Pentelikon (SPAP), along with all the volunteers, local communities as well as SKAI Radio and TV for their contribution to this unique tree-planting day.